Mixon will split his offseason between Cincinnati and California, focusing on his stamina and durability in anticipation of large workloads under new head coach Zac Taylor, Geoff Hobson of the Bengals' official website reports. 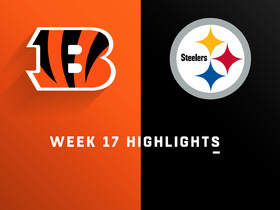 Mixon carried the ball 13 times for 105 yards in Sunday's 16-13 loss to the Steelers. He also added one reception for two yards. Mixon accounted for 68 rushing yards on 17 attempts, adding two receptions for 10 yards during Sunday's 26-18 loss to Cleveland. Mixon (wrist/thigh) practiced fully Friday and doesn't carry an injury designation into Sunday's game against the Browns. Analysis: With wideout Tyler Boyd (knee) joining A.J. Green and tight end Tyler Eifert on the sideline this weekend, Mixon is once again in line to be the focal point of the Cincinnati offense. He's logged 53 carries for 240 yards and three scores over his last two games and should continue his high-volume ways in Week 16. Mixon (wrist/thigh) was a limited participant in Thursday's practice, Jay Morrison of The Athletic reports. Mixon was limited at practice Wednesday by a wrist injury, Paul Dehner Jr. of The Cincinnati Enquirer reports. 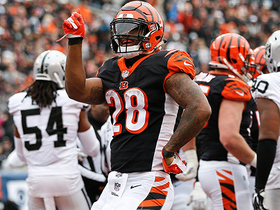 Analysis: Mixon logged 52 of the Bengals' 80 offensive snaps in the Week 15 win over the Raiders, carrying 27 times for 129 yards and two TDs and nabbing two receptions for one yard. Given that hefty workload, it's likely that Mixon's limitations Wednesday were maintenance-related. He should be good to go for Sunday's game in Cleveland. Mixon carried 27 times for 129 yards and two touchdowns Sunday against the Raiders. He added two catches for one yard in the 30-16 win. Analysis: Mixon enjoyed season highs in carries and rushing yards while averaging 4.8 yards per tote. He went in on a one-yard touchdown plunge in the second quarter and capped off the scoring with a 15-yard scamper in the fourth. Mixon was hardly involved as a receiver, but that likely had to do with his team playing with a lead for most of the game. He'll look to follow up this stellar effort in Week 16 against a beatable Browns run defense. Mixon racked up 111 rushing yards and a touchdown on 26 carries, adding five receptions for 27 yards during Sunday's 26-21 loss to the Chargers. Mixon (foot) doesn't have an injury designation for Sunday's game against the Chargers, Katherine Terrell of ESPN.com reports. Analysis: Mixon was a limited practice participant Wednesday and Thursday, but there never seemed to be much concern about his Week 14 availability. 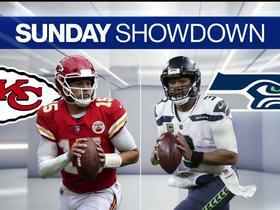 The Bengals are in a tough spot as heavy road underdogs this week, facing a Chargers defense that's tied for 13th in yards per carry (4.4) and 11th in rushing yards allowed (104 per game). Mixon and wideout Tyler Boyd are doing their best to keep an injury-depleted offense afloat. Mixon (foot) was a limited participant during Thursday's practice, Jay Morrison of The Athletic reports. Mixon (foot) was spotted at practice Thursday, Paul Dehner Jr. of The Cincinnati Enquirer reports. Analysis: Mixon was listed as limited Wednesday, but his presence at practice Thursday suggests that his foot issue is something that is being managed, as opposed to being the result of a practice setback. We'll circle back on his status later Thursday to see how the Bengals list his level of participation. Mixon was limited at practice Wednesday due to a foot injury, Geoff Hobson of the Bengals' official site reports. Analysis: It's uncertain if Mixon is carrying the injury over from Week 13 action or if he hurt his foot during Wednesday's session. 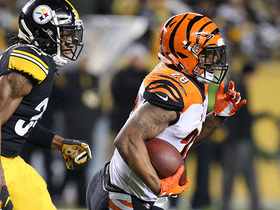 If Mixon ends up being limited or withheld from Sunday's game against the Chargers, added backfield opportunities would be available for Giovani Bernard. Mixon rushed for 82 yards on 12 carries and added 13 yards on two catches during Sunday's 24-10 loss to Denver. Mixon rushed 14 times for 89 yards and caught all seven of his targets for 66 yards in Sunday's 35-20 loss to Cleveland. Mixon ran for 14 yards and a touchdown on 12 carries and added three catches for 38 yards during Sunday's 24-21 loss to Baltimore. Mixon (knee) doesn't carry an injury designation into Sunday's game against the Ravens, Paul Dehner Jr. of The Cincinnati Enquirer reports. Analysis: Per Katherine Terrell of ESPN.com, Mixon was able to log a full practice Friday, thus setting the stage for him to continue heading the Bengals' backfield in Week 11. Mixon carried 11 times for 61 yards to go along with two catches for 24 yards last weekend against the Saints, but his modest usage was dictated by the game flow in a 51-14 loss. An uptick in opportunities thus seems likely for Mixon in the AFC North showdown. Mixon (knee) took part in Friday's practice with no apparent limitations and "looks good to go" for Sunday's game against the Ravens, Jay Morrison of The Athletic reports. 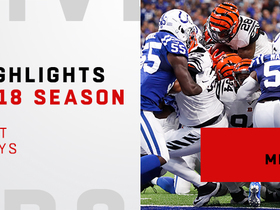 Analysis: The Bengals will reveal later Friday whether Mixon's activity was enough for him to enter the Week 11 tilt minus an injury designation. In any event, it appears as though Mixon's addition to the team's injury report Thursday was not cause for major concern after all. Mixon (knee) was spotted on the field at Friday's practice, Jay Morrison of The Athletic reports. Analysis: It won't be clear until after practice how much work Mixon was able to get in, but his presence alone provides optimism that he will be able to play Sunday against the Ravens despite being added to the injury report Thursday. The Bengals will reveal Mixon's official status for Week 11 after Friday's session comes to a close. Mixon (knee) was listed as a limited practice participant Thursday, Paul Dehner Jr. of The Cincinnati Enquirer reports. Mixon was effective when used Sunday against the Saints, carrying the ball 11 times for 61 yards to go along with two catches for 24 yards. Analysis: Unfortunately for Mixon, the Bengals were getting blown out, so running opportunities after the second quarter were scarce. The Bengals next travel to Baltimore, where the game at least figures to be closer, even if the matchup isn't great for Mixon. 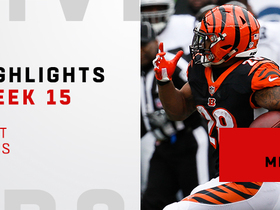 Watch Cincinnati Bengals running back Joe Mixon's best plays in the 2018 season. 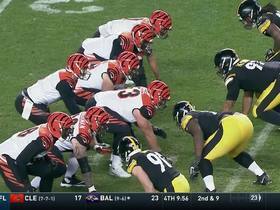 Watch as the Cincinnati Bengals take on the Pittsburgh Steelers in Week 17 of the 2018 NFL season. 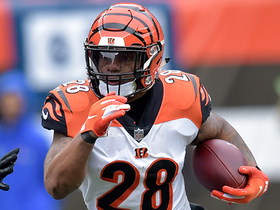 Cincinnati Bengals running back Joe Mixon shows off speed on 20-yard gain. 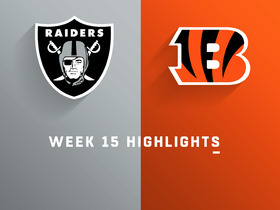 Watch highlights from Cincinnati Bengals running back Joe Mixon's 149-yard game in his Week 15 matchup against the Oakland Raiders. 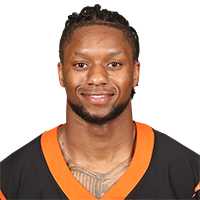 Cincinnati Bengals running back Joe Mixon seals the game with a 15-yard touchdown rush. 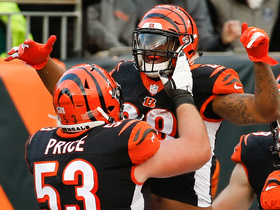 Cincinnati Bengals defensive end Sam Hubbard lead blocks for running back Joe Mixon's goal-line touchdown.